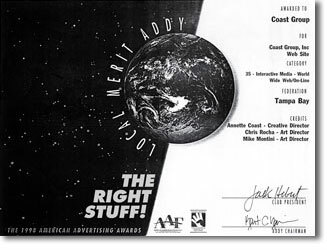 The American Advertising Federation awarded the Coast Group a Local Merit Addy for design of the Coast Group website in 1998. Annette Coast (now Annette Coast-Anatra, president of ZOOM Design), formerly vice president of the Coast Group was the creative director on the project. 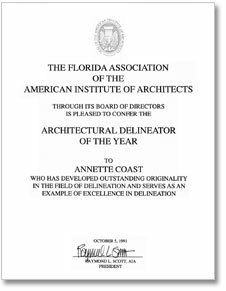 The Florida Association of the American Institute of Architects awarded Annette Coast (now Annette Coast-Anatra) as Architectural Delineator of the Year in 1991 for acheiving “outstanding originality in the field of delineation and serves as an example of excellence in delineation”.